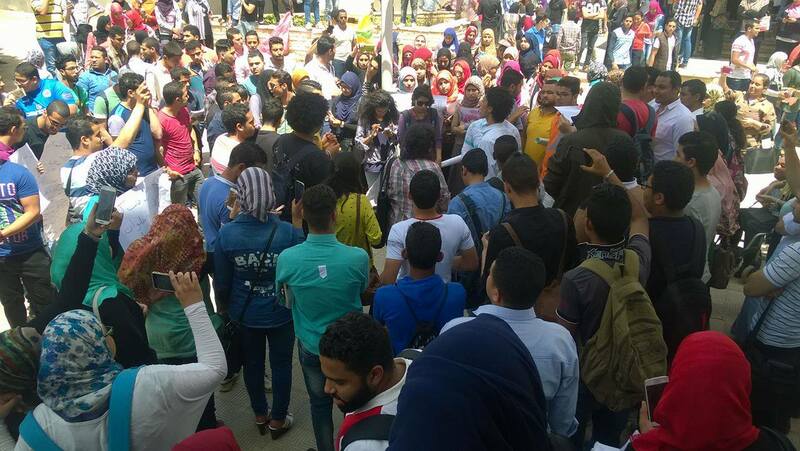 A number of students at Helwan University gathered on Sunday to protest against Egypt’s recent agreement with Saudi Arabia to give up control of the Red Sea islands of Sanafir and Tiran, according to local reports. The students chanted slogans such as “bread, freedom…these islands are Egyptian” and “the people want the downfall of the regime.” The latter was repeated frequently during the 2011 and 2013 uprisings, while the former is an adaptation of another slogan of the 2011 revolution. Local media outlet Ya5abar quoted students participating in the demonstration as saying they are independent and are not affiliated with any political party or movement. The students’ demonstration comes two days after hundreds gathered in front of Cairo’s Press Syndicate and in other cities across the country, chanting against the “selling of Tiran and Sanafir islands” and calling for the downfall of the regime and the president’s resignation. Security forces blockaded the demonstration in an attempt to stop more protestors from joining, deploying tanks in nearby areas, according to Al Masry Al Yom. Police forces had fired tear gas and dispersed a protest at Mostafa Mahmoud Street. Over 100 people were arrested across nine governorates for participating in the demonstrations, which the interior ministry had warned people from joining.